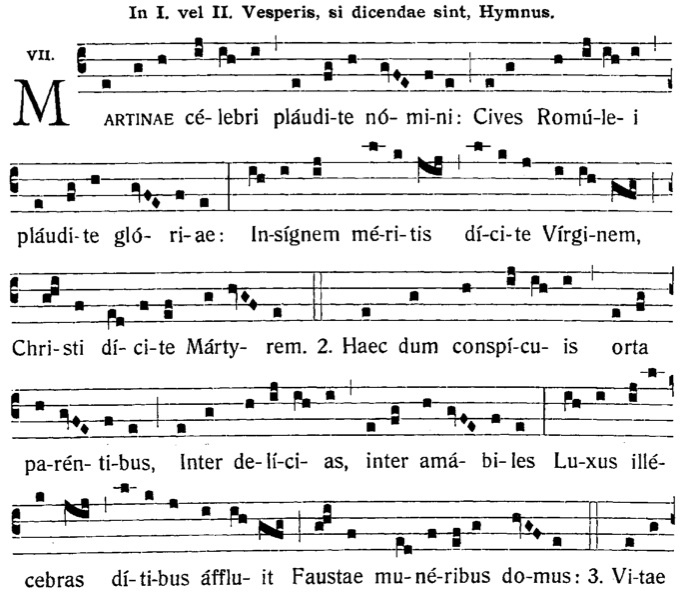 Divinum Officium lists the hymn "Tu natale solum" for II Vespers of St. Martina (January 30) under the 1960 rubrics. Does anyone have the proper melody? The 1913 Vesperale has a different hymn, "Martinae celebri plaudite". Neither of the hymns are on Gregobase. I checked the 1961 Liber and the 1957 Mass & Vespers - nada. This suggests that the two hymns are divisions of one 12-stanza hymn, Martinae celebri plaudit. The third division begins Non Illam crucians. It's barely possible that the tune is listed under that third division. Can you possibly use a generic martyr hymn? The Melody is in the Roman Antiphonal (Liber Antiphonarius, No. 820) 1949 ed. The above are all part of one Hymn of 10 verses. Melody below, have checked the Global chant database and no alternative melody is suggested for this hymn. 44. On the feast of St. Martina (January 30), the hymn Martinae celebri together with the second part Non illam crucians is said at Matins, while the hymn Tu natale solum is taken at Lauds and at Vespers. Thanks to the analysis done by Kathy and Tomjaw, I'm assuming that the three hymns all have the same official melody, but if anyone has confirmation that would be appreciated. The "Asclepiadic and Glyconic" 12.12.12.8 rhythm seems odd - not sure if I could even find a replacement. Sorry I was not clear the melody is the same for all the Hymns listed above as found in my Liber Antiphonarius, No. 820 1949 ed. therein they are all fully notated (with Solesmes markings) unlike the 1912 online antiphonal, linked above. Note the Global chant database is not complete! I am sure I have seen other melodies!